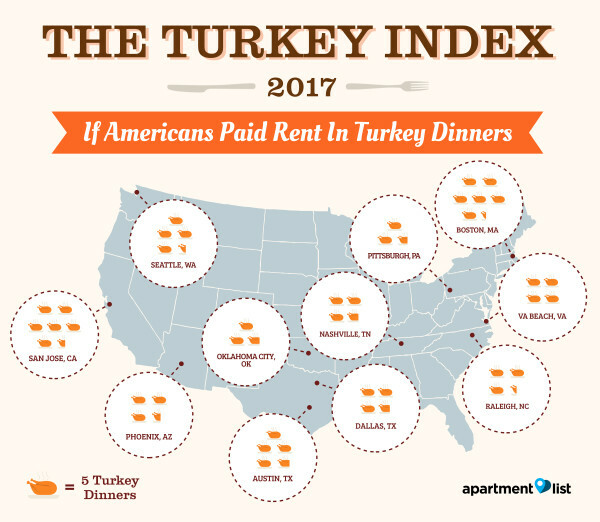 With Thanksgiving just a gobble days away, it’s time to feast your eyes on the 2017 edition of our annual Apartment List Turkey Index! Thanksgiving is the ultimate celebration of food, family, friends and football – a combination that always makes for lively conversation. If your dinner table is anything like mine, the conversation inevitably turns to a question as old as thyme – how many turkey dinners would it cost to pay our rent? Thankfully, we can now a-maize our guests by answering that question definitively. No need for you to fry your brain either. We’ve done the math for you! To create our Apartment List Turkey Index, we used two data points: the median price of a two-bedroom apartment and the average cost of a Thanksgiving dinner, adjusted for each city’s cost-of-living. 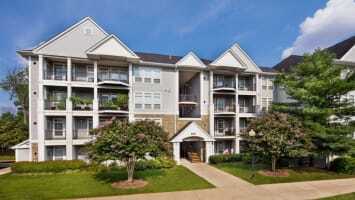 We use Apartment List estimates for median rent prices. To calculate our rent estimates, Apartment List starts with reliable Census numbers, and then extrapolates them forward, using price change data from the millions of listings on our site. For the Thanksgiving dinner price, we use the Bureau of Labor Statistics prices for ingredients needed to prepare a Thanksgiving dinner. The dinner cost came to $63.84 when you include turkey, stuffing, a vegetable, mashed potatoes and apple pie. Then, we adjusted the prices for each city, using the grocery component of a cost-of-living index. 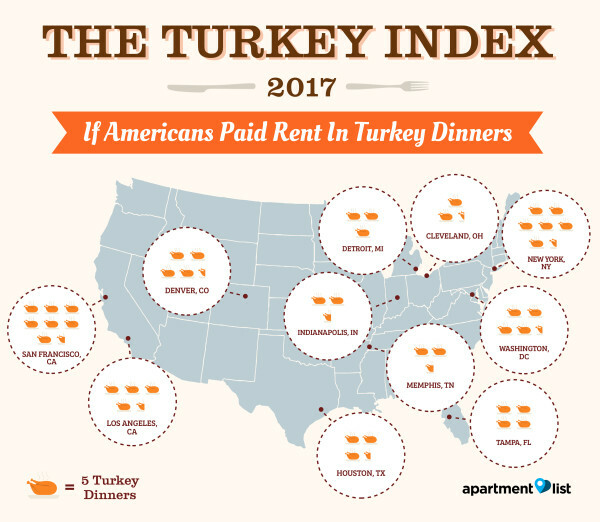 Finally, we divided each city’s two-bedroom rent price by the average cost of a Thanksgiving dinner to get the Turkey Index. As you might expect, our Turkey Index has quite a spread, depending on location. San Francisco tops our list at No. 1, with the monthly two-bedroom rent weighing in at a pricey 38.4 turkey dinners (not to mention the time and effort of delivering all that food safely to your landlord in hilly San Francisco–more than enough to make the original Pilgrims turn over in their gravy). While other California cities may require less delivery effort, they still require plenty of turkey dinners, with San Jose ranking No. 2 (32.2), San Diego at No. 5 (27.5) and Los Angeles at No. 7 (23.4). 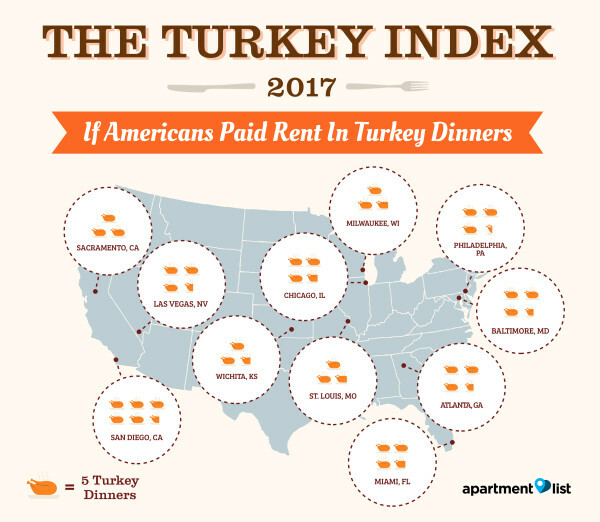 It’s not just California renters who need over two dozen turkey dinners to pay rent. 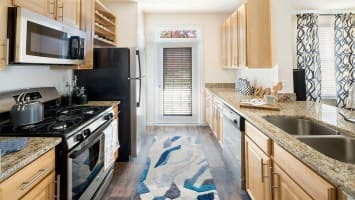 Renters better start cooking now in No. 3 New York (32.1), No. 4 Boston (neighbor to Plymouth Rock) (30.8) and No. 6 Austin (24.1). Our Turkey Index is based on both rent and grocery prices, and the cities with pricey rents don’t always have the most expensive groceries, or vice versa. Groceries in Honolulu were the most expensive, knocking the stuffing out of shoppers, with each Thanksgiving dinner costing $105.66, about 61 percent more than the national cost, with not much money to baste! Groceries are pricey, leaving you with hardly a leg to stand on, in many of the most expensive cities nationwide — the Bay Area, Seattle and New York — but some cities with affordable rents have high groceries bills, putting renters in quite a jam. For example, Pittsburgh and Cleveland rents are $910 and $800, respectively, but groceries cost about $72, above the national average of $63.84. If you’re planning a trip to stock up on Thanksgiving groceries, we recommend making a pilgrimage to Houston, Richmond, Va., or Oklahoma City, where our Thanksgiving dinner costs $54.39, $55.09 and $55.73, respectively, with possibly enough to budget for a vase of (May)flowers! For reference, we’ve included data for the full set of cities included in our analysis. 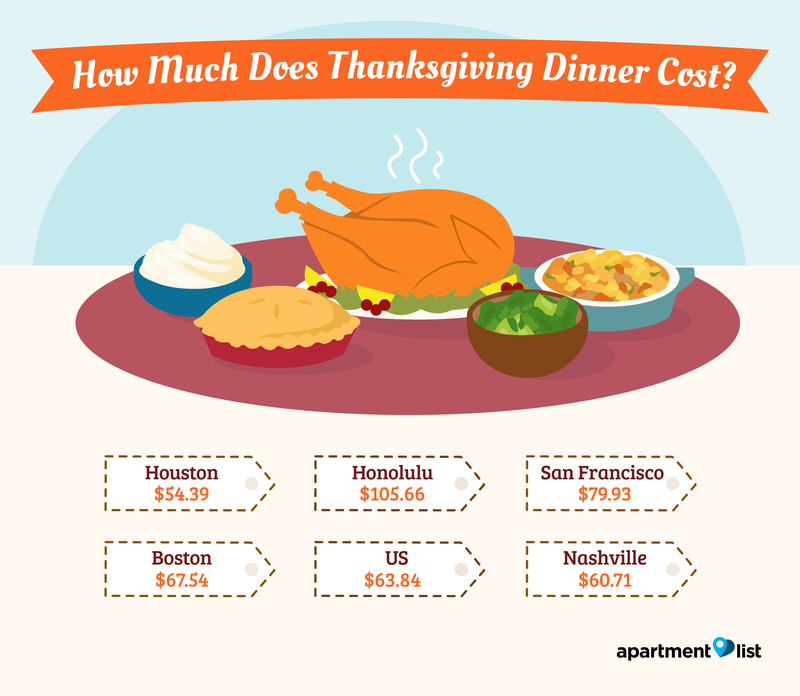 See the table below to compare rent costs in turkey dinners in over 800 cities across the country. Now, in the warmth of your homes, time to raise your gobble-lets for a toast: Happy Thanksgiving! 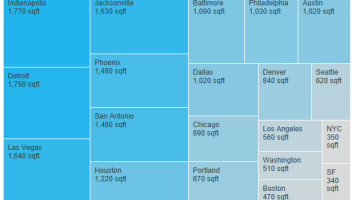 Where do renters get the most for their money?